The Bowman Livestock Auction ring was full of very nice Angus heifers. 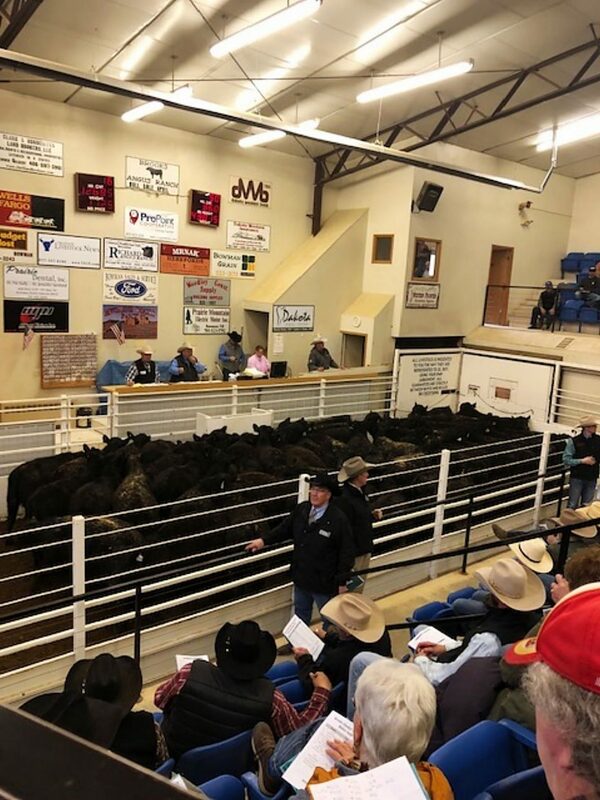 It was a great sale for Brooks Chalky Butte Angus Ranch. They offered a great set of Angus open heifers and a great set of black baldy open heifers. 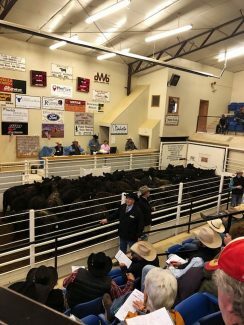 The bulls were met with strong demand, as the Bowman Auction Market was full of repeat buyers. Lot 19 at $45,000, Brooks Broken Bow 810, DOB 2-8-2018, Reg 19249139, KM Broken Bow 002 x Black Maid 6256 BCBR, sold to ABS Global, Deforest, Wisconsin. Lot 8 at $12,000, Brooks Niagara 8277, DOB 2-24-2018, Reg 19252127, SS Niagara Z29 x Pridola 5232 BCBR, sold to Brian Govan, Mercer, North Dakota. Lot 43 at $9,000, Brooks Investment 8408, DOB 3-9-2018, Reg 19250249, Sitz Investment 660Z x Lady Jewel 4399 BCBR, sold to Wade Wilson, Watford City, North Dakota. Lot 69 at $9,000, Brooks Fortress 8258 CDB, DOB 3-18-2018, Reg 19252133, KCF Bennett Fortress x Lady 504 CB, sold to Alta Genetics, Balzac, Alberta. Lot 7 at $8,000, Brooks Niagara 8259, DOB 2-23-2018, Reg 19249212, SS Niagara Z29 x Blackbird 5125 BCBR, sold to Vicki Czywczynski, Scranton, North Dakota. Lot 11 at $8,000, Brooks Niagara 889, DOB 2-19-2018, SS Niagara Z29 x Pricess 637 BCBR, sold to Vicki Czywczynski Scranton, North Dakota. Lot at 31 $8,000, Brooks Heritage 8332, DOB 3-08-2018, Reg 192150429, VAR Heritage 8382 x Lady Blackbird 4216 BCBR, sold to Vicki Czywczynski, Scranton, North Dakota.